Even small businesses need a great brand image, a great small business brand can help you stand out in a crowded market place. A brand should be carried through your entire business, here are some must know small business brand tips to get you noticed. 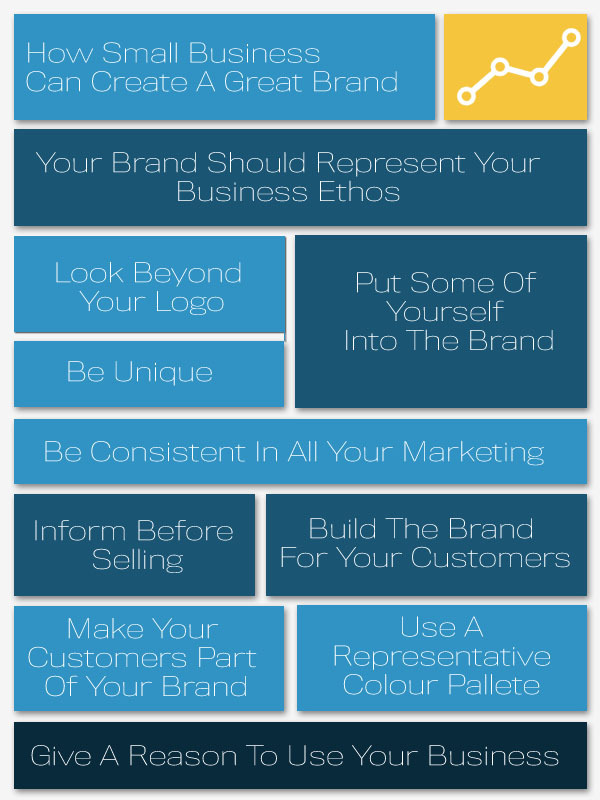 Your Brand should represent your business ethos. Your brand should encompass every aspect of your business its not just about image its about who you are. Yes your Logo is important however its just part of your brand. Stand out from the crowd use your brand to really represent your business. Put some of yourself into the brand. Put yourself into your brand are you fun and quirky, or neat professional. Use your brand to showcase who you are. Be consistant in all your Marketing. Make sure your branding is consistent across all your marketing material. Use your brand to inform before selling, most people go through a buying process of finding out about a product or service make sure you inform before you sell. Build the brand for your customers. Don’t just build a brand that you like, consider what your customers would like and build the brand aimed at the type of customer you want to attract. Make your customers part of your brand. A great way of attracting new business is testimonials and reviews use your current customer base in your branding to attract new business. Use a representative colour pallete. Use colours that work for your business and your customers. Do some research on what colour represent. Give a reason to use your business. Tell people what makes you different why should they buy from you. Have you got some small business branding tips or a story to tell please feel free share below. Why not find out more about us.